Join the iconic Variety Bash proudly sponsored by Tim Adams / Mr Mick Wines. It’s an event like no other, taking you to places you’ve never heard of, let alone been to, in support of kids in need. Ya Gotta Do It! 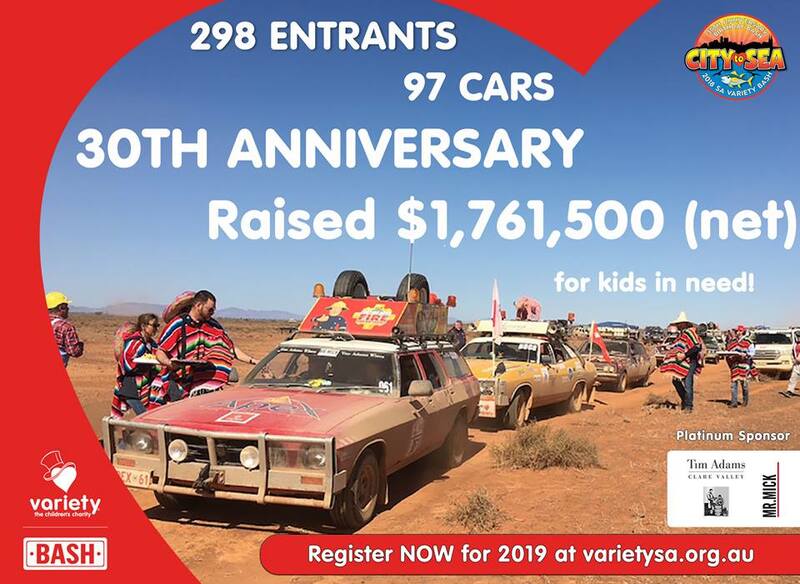 The 2019 SA Variety Bash will be departing from Codan (Mawson Lakes) on Saturday 10 August and finishing eight days later on 17 August in Murray Bridge. On this year’s event, the entrants will be taken on numerous interesting tracks and through many private properties seeing parts of our countryside that many people would never have the opportunity to experience. During the event there are various trophies awarded to encourage fundraising, fun themes, fun for the kids and overall fun… the ultimate winners of the Bash are the kids in need. The 30th Anniversary of the SA Variety Bash ‘City to Sea’ left from Adelaide on Saturday 11 August and after eight days and a total of 2240km travelling through some amazing private property and scenic Bash tracks, the contingent arrived in Port Lincoln to a huge welcome from the locals, before a celebration dinner in a marquee on the Port Lincoln foreshore. There were many highlights for the 300 SA entrants in 100 vehicles; the grants along the track, the entertainment, the seafood lunch, the 30th Anniversary Birthday Dinner at North Well Station and of course our theme day event, Basharama. However the announcement on the final night that the 2018 SA Variety Bash had raised an amazing $1.76 million net for our kids in need was the biggest highlight of them all! Over the past 30 years the SA Variety Bash has raised in excess of $41 million (net). Register here, or contact Annie or Kate for more information. 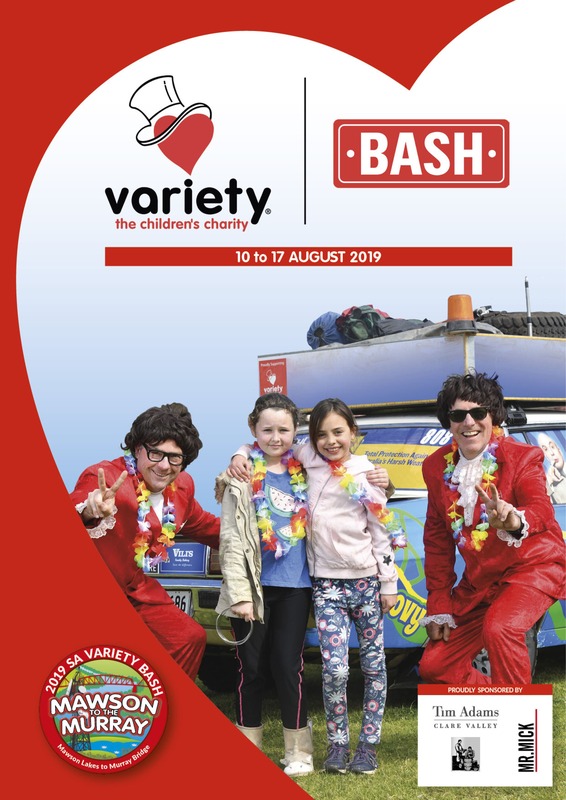 At Variety South Australia we are extremely grateful to each and every one of our Bash entrants who tirelessly raise funds throughout the year to assist South Australian children who are sick, disadvantaged or have special needs. That is why we endeavour to support you along your fundraising journey by providing information, advice and suggestions about everything related to the SA Variety Bash. We also list the fundraiser flyer and details on our event and entrant fundraisers calendar. Go to the Event and Entrant fundraisers calendar now! Tim Adams Airlines is based on (the now defunct) TAA Airlines and features stewardesses, a pilot and ground crew. Tim Adams Wines is also the major sponsor for the SA Variety Bash, making the annual colourful event possible. Despite this, the team still fund-raises and in 2016, contributed an impressive $105,105 to be the third highest fundraisers! They also took out the award for being the outright winners of the Bash. If you require any further information at all Bash related, contact our office and speak with our friendly events team today!